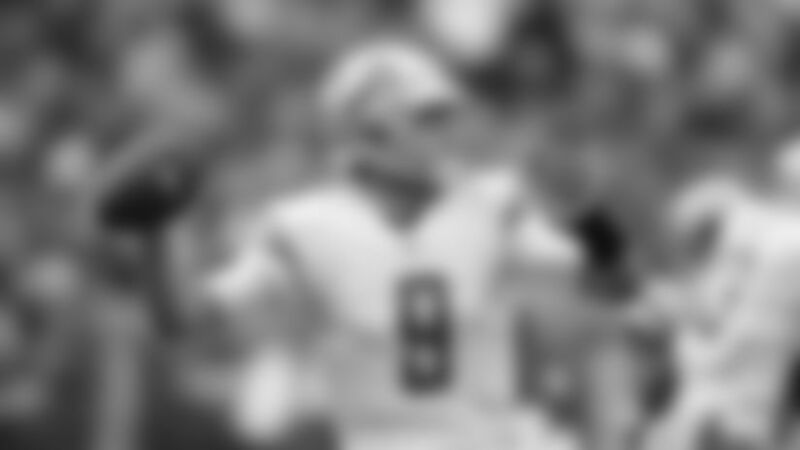 Take a look through the best reaction shots from some of Sunday's big plays over the Buffalo Bills. Jahleel Addae celebrates a tackle against the Buffalo Bills at New Era Field during Week 2. Darius Philon and Uchenna Nwosu celebrate Nwosu's sack against the Buffalo Bills at New Era Field during Week 2. Virgil Green and Mike Williams at New Era Field during the Bolts' Week 2 game against the Buffalo Bills. Mike Williams celebrates his first NFL touchdown against the Buffalo Bills at New Era Field. Melvin Ingram and Mike Williams celebrate Williams' first NFL touchdown during the Chargers' Week 2 game against the Buffalo Bills. Mike Williams celebrates his first NFL touchdown with the rest of the team during the Chargers' Week 2 game against the Buffalo Bills. Derwin James celebrates a sack of Buffalo Bills' quarterback Josh Allen during the Chargers' Week 2 game at New Era Field. Derwin James points up after sacking Buffalo Bills quarterback Josh Allen during the Chargers' Week 2 game at New Era Field. Trevor Williams, Jahleel Addae and Derwin James celebrate James' sack during the Chargers' Week 2 game against the Buffalo Bills. Melvin Gordon celebrates a touchdown against the Bills during the Chargers' Week 2 game at New Era Field. 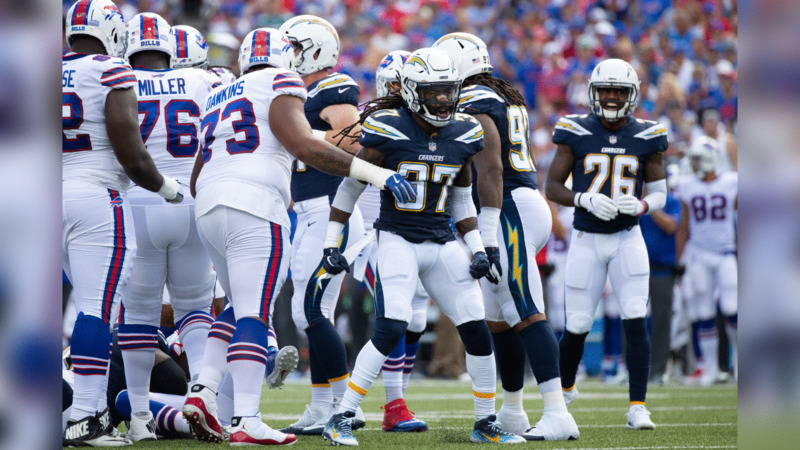 Damion Square and Melvin Ingram celebrate a sack against the Buffalo Bills during the Chargers' Week 2 game at New Era Field. Damion Square and Chris Landrum celebrate a sack against the Buffalo Bills during the Chargers' Week 2 game at New Era Field. Melvin Gordon celebrates another touchdown against the Buffalo Bills during the Chargers' Week 2 game at New Era Field. Mike Williams and Melvin Gordon celebrate Gordon's touchdown during the Chargers' Week 2 game against the Buffalo Bills at New Era Field. Dan Feeney lifts up Melvin Gordon in celebration after Gordon's second touchdown during the Chargers' Week 2 game against the Buffalo Bills. Justin Jones and Darius Philon celebrate a tackle against the Buffalo Bills during the Chargers' Week 2 game at New Era Field. The Bolts celebrate Melvin Gordon's third touchdown of the day against the Buffalo Bills during the Chargers' Week 2 game at New Era Field. Adrian Phillips celebrates an interception against the Buffalo Bills during the Chargers' Week 2 game at New Era Field. Derwin James flashes a smile after a tackle against the Buffalo Bills during the Chargers' Week 2 game at New Era Field. Kyzir White and Derwin James celebrate White's first NFL interception during the Chargers' Week 2 game against the Buffalo Bills. The Bolts celebrate Kyzir White's first NFL interception during the Chargers' Week 2 game against the Buffalo Bills at New Era Field. Melvin Ingram, Casey Hayward and Kyzir White celebrate White's first NFL interception against the Buffalo Bills at New Era Field. Melvin Ingram and Philip Rivers smile after the Bolts win 31-20 over the Buffalo Bills at New Era Field. Philip Rivers, Melvin Ingram and Keenan Allen share a laugh in the locker room after the Bolts win, 31-20, over the Buffalo Bills at New Era Field.